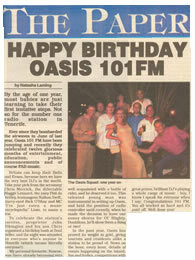 Formed in 1996, Oasis Fm is Tenerifes local station! 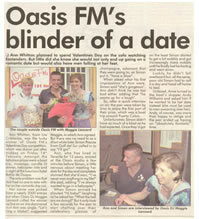 Oasis Fm is a British radio station established in Tenerife in 1996, aimed at English speaking ex-pats and tourists. Our target audience is 26-65 year old listeners who want to hear the enduring mainstream music they buy, and who appreciate an editorial output that reflects their lifestyle with great music from the last two decades. Oasis Fm is Tenerife’s favourite British radio station combining a blend of today’s best music with news, sport, and local information, and is the only station in the Canary Islands licenced to use the IRN international news. - It is the only English speaking radio station based in Tenerife backed by key industry players. - It is the only local radio station aimed at the party hungry, fun seeking tourists. - It is the only station based in Tenerife supported by ex-pats and UK based Tour Operators including Club 18-30, Thomson Holidays, First Choice Holidays, and My Travel. We constantly re-invent the output to keep the station sounding fresh and exciting. Promotional partnerships with some of the UK’s biggest brands allow us to create programming that stands out in the minds of our listeners as well as delivering client’s sales or marketing messages with maximum effect. Today many household names such as PG Tips, Iceland, Monarch, KFC, BA, BMI Airlines, Thomsons and 1st Choice Holidays use the Oasis Fm group on a daily basis as part of their marketing campaigns. Our latest acquisition is the 'Canarian Weekly' newspaper, which enhances the choice available to advertisers, listeners and readers alike. Our clients now have the unique situation of being able to run bi-media campaigns across both of our platforms in audio and print to achieve maximum results. 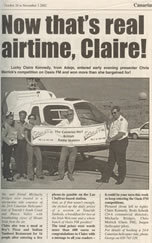 Oasis Fm listeners can enjoy the same quality entertainment and information, they have come to expect on the radio, in the Canarian Weekly newspaper as well. Oasis Fm is, Tenerifes local station!